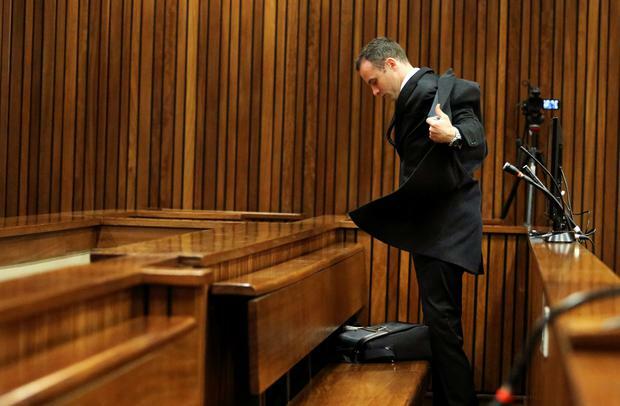 "Blade Runner" Oscar Pistorius told a friend to take the blame for him accidentally firing a pistol under the table in a packed Johannesburg restaurant in January 2013, a month before he killed his girlfriend, his murder trial heard today. Testifying at the trial of the South African Olympic and Paralympic track star, professional boxer Kevin Lerena described how he, Pistorius and two others had been having dinner at Tashas restaurant when the gun went off. The charge of firing a gun in a public place is part of prosecution attempts to portray the 27-year-old athlete, who shot dead model Reeva Steenkamp on Feb. 14 last year, as a firearms-obsessed hot-head. Pistorius denies murdering Steenkamp, saying he fired four rounds from a 9 mm pistol through a locked toilet door at his luxury Pretoria home after mistaking her for an intruder. Lerena, who goes by the ring name "The KO Kid", said one of the group at the table in Tashas, Darren Fresco, passed his pistol under the table to Pistorius during the lunch, telling him there was "one up", indicating a round was in the chamber. "A shot went off. Then there was just complete silence," Lerena said. "I looked down at the floor and exactly where I looked down, where my foot was, there was a hole in the floor." "I had a little graze on my toe, but I wasn't hurt," he added. Restaurant owner Jason Loupis told the court 220 diners had been present at the time. A child was sitting at the table next to Pistorius, his wife Maria added in her testimony. Pistorius immediately apologised to his friends and checked they had not been hurt, but then turned to Fresco and asked him to take responsibility, Lerena said. "'Please take the blame for me - there's too much media hype around me'," Lerena quoted Pistorius as saying. "'Take the blame because this can be big.'" When the restaurant owners came up to investigate, Fresco told them the gun had fallen out of the pocket of his tracksuit trousers. "I said to him 'What's the first rule of owning a gun? Safety first?'" Maria Loupis said. "He said 'Yes' and I hit him over the head." Pistorius paid the bill and the group left, she added. At the Pretoria High Court, Pistorius' defence team wound up its cross-examination of a third prosecution witness who said he had heard shouts and screams from Pistorius' house before shots were fired on the night Steenkamp died. Earlier, lead defence advocate Barry Roux tried to undermine the testimony of wife and husband Michelle Burger and Charl Johnson, who lived 177 metres (195 yards) away in an adjacent housing complex, as being too similar to be credible. "You could just as well have stood together in the witness box," he said, earning his second rebuke of the three-day-old trial from Judge Thokozile Masipa. Besides denying murder, Pistorius, who had his disabled lower legs amputated as a baby and now runs on carbon fibre prosthetic "blades", has pleaded not guilty to the Tashas gun charge. He is also accused of putting a bullet through the sun roof of a former girlfriend's car in a separate incident. The trial is being broadcast daily on live television, a first for South Africa, although most witnesses have asked for their faces not to be shown to protect their identity. Johnson, the neighbour, said on Wednesday he had received "intimidating" phone calls the previous night from people who had heard his phone number read out in court during his wife's earlier cross-examination.